Citizen of many countries don’t need visas for any country in Central American so it makes it easy to move around and travel in the region. But there are always questions about Central America border crossing; how it works? where to cross? what do you need? etc. In this article we’ll try to answer them so that you’ll get an idea about it. All the information is from our own experience of land border crossing in Central America during our 13 months Latin American trip. Mexico – Guatemala – El Salvador – Honduras – Nicaragua – Costa Rica – Panama. We skipped Belize because it seemed expensive and was a bit out-of-the-way for us. All mentioned below formalities and fees are for land border crossing only. If you fly in or out their can be different. 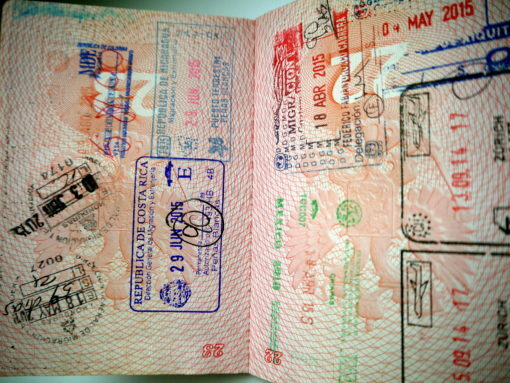 One blank page in the passport for stamps. Check the conditions of entering Guatemala for citizens of your country HERE. We came from San Cristobal de las Casa in Mexico by bus and crossed the border at La Mesilla. The bus stops at Mexican Immigration office where you get an exit stamp. Then by shared taxi you go to the border itself. There were no buses but taxis are not expensive. Taxi drops you right at the border. Then you just walk across it and once in Guatemala on the right there will be a small building, it’s Guatemalan Immigration office. You pay a fee and get stamped in. At the Immigration office nobody asks any exit tickets, prove of accommodation etc. Most tourists get 90 days on arrival BUT since Guatemala, El Salvador, Honduras and Nicaragua are members of The Central America-4 (CA-4) Border Control Agreement your 90 days are for all four countries not only for one. Keep it in mind because some tourists overstay their visa without having any idea about it. After you are stamped in just keep walking through the chaotic town to the bus terminal. Unless you arrive late than it can be better to stay overnight there. The bus terminal is about 20-30 min. walk from the border. There will be many buses but there was none going straight to the capital, or Antigua, or Xela. So we had to catch one bus to Huehuetenango, stayed there overnight and next morning caught a bus to Xela. For more details on Guatemala check our article “Guatemala backpacking guide“. 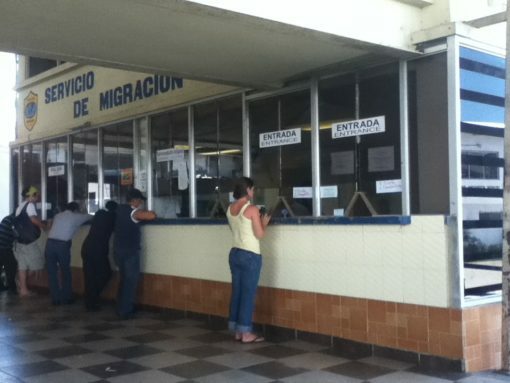 Check the conditions of entering El Salvador for citizens of your country HERE. We crossed at La Hachadura and got to this border from Antigua. It took a while, we changed two buses waited for our driver to finish his lunch and after 5 hours finally arrived at the border. Here both Immigration offices are right at the border so you get stamped out of Guatemala, walk across the bridge and get stamped in to El Salvador. They can ask you where you are planning to go but don’t ask any exit tickets or booking. Remember, your 90 days are still the same you got entering Guatemala. From the border we caught a bus and went to Juayua. Buses in El Salvador are quite cheap never paid more than 2-3$. Interesting fact once you cross the border people become taller and bigger, so after tiny Guatemalans Salvadorans look quite big. For more details on El Salvador check our article”El Salvador, our travel guide“. Check the conditions of entering Honduras for citizens of your country HERE. We crossed the border at El Poy. Again the same story, no questions, exit tickets or booking. You walk from one Immigration office to the other, it’s about 5-7 min. walk there are some kind of tuc tucs if you don’t feel like walking in the heat you can catch one of them, they are quite cheap. After all formal procedures you catch a mini bus to get to the nearest town Ocotepeque and then switch it to a different one to get to your final destination. Most tourists who come to Honduras go to Copan ruins and one of the Caribbean islands; Roatan or Utila. We really liked Utila. Check our article “Roatan, Caribbean diving on a budget“. Stamps of Nicaragua, Costa Rica, Honduras and Guatemala. Central America border crossing. Check the conditions of entering Nicaragua for citizens of your country HERE. We crossed the border at Guasaule. It was the only one border we didn’t cross on our own; we got there by a shuttle bus from La Ceiba. It drove us all the way to Leon (Nicaragua). And there were some reasons; first of all Honduras is a dangerous country and to get from the Caribbean to Nicaragua you have to cross all of it. And second, to go by public buses it’d take us two days with a couple of switches and overnight in a strange town on the way. For safety reasons we decided to take a shuttle. Shuttle bus drove almost nonstop but it still took us more than 15 hours to get from La Ceiba to Leon. It stops at both border crossings after you get your stamps and pay fee it keeps driving. I don’t think to cross this border on your own can be more difficult. If you head to Leon make sure to book something there at least for one night. First, because you arrive late and walk around the city at night with all your belongings looking for accommodation is not the best idea. Second, since you arrive quite late most hostels and cheap hotels are full by that time. It happened to us, we had to walk around at midnight trying to find a place to sleep. Our article on a very nice island off the beaten track in Nicaragua “Little Corn island Backpacker’s guide“. Yellow fever certificate if coming from: Angola, Benin, Burkina Faso, Cameroon, Democratic Republic of the Congo, Gabon, Gambia, Guinea, Liberia, Nigeria, Sierra Leone, Sudan, Bolivia, Venezuela, Brazil, Peru, Colombia, Ecuador and the Republic of Guyana. Check the conditions of entering Costa Rica for citizens of your country HERE. This border we crossed at Penas Blancas. Again we got there by public bus from Rivas. It took some time to get an exit stamp from Nicaragua because of many people in the queue. We had to pay again, this time an exit fee, which is quite annoying. Then the same story you walk across the border from Nicaragua Immigration to Costa Rica one. You can go by bus all the way to San Juan from many places in Nicaragua, of course it’ll be more expensive but maybe a bit easier. To enter Costa Rica you need to have an exit ticket and not from any other country of Central America but exactly from Costa Rica. It can be a bus/plane or boat ticket. We didn’t expect it, we had an exit ticket from Panama in two weeks (which made it obvious we were going to leave Costa Rica) but an officer didn’t want to accept it and insisted on an exit ticket from Costa Rica. There was no Internet so we couldn’t book another ticket and with many other tourists had to go and buy a bus ticket in a counter outside. We bought the cheapest one back to Nicaragua for 20$ which we neither needed nor used. In Costa Rica you get “new” 90 days. Right outside the Immigration office there is a bus stop from where you can catch a bus to the capital and some other places. For more details on travel Costa Rica on a budget check our article “Costa Rica traveling on less than 20$ per day“. A copy of your passport (page with photo), nobody asked us but it’s better to have just in case. Check the conditions of entering Panama for citizens of your country HERE. We crossed at Paso Canoas, where we got from Puerto Jimenez. To get there we had to catch a boat first and then a bus. The border crossing is again on foot just a bit busier than other borders; many cars and buses. To leave Costa Rica you have to pay 7$ and only after you get stamped out. To enter Panama you need an exit ticket and some kind of bank statement/ATM slip or cash to show that you have enough money. We had screenshots of our accounts from online banking. They did check tickets and financial prove. From Panama we continued to South America and flew to Colombia. At the counter the airline staff before checking us in asked to show our exit tickets from Colombia. 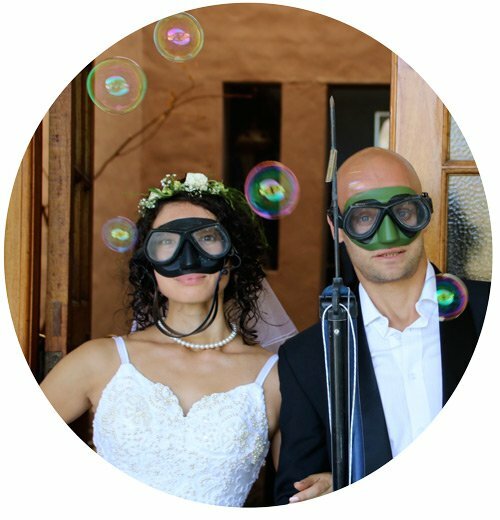 We knew they would and booked some random ticket using our favourite website Agent.ru. Some tourists didn’t have any and had to buy at the airport tickets out of Colombia otherwise they couldn’t be checked in to the flight. For more details on traveling Panama check our article “Backpacking in Panama“. All the countries of Central America have different currency, most of them their own but some; El Salvador and Honduras use USD as their local currency. It was never a problem to exchange money at any border, there are always people offering money exchange. It’s better to have an idea of official exchange rate that people can’t cheat on you. For this we always use XE Currency exchange app, you can download it for free from Apple store or Google Play. Usually there are no ATMs at border crossing so it’s better to have some cash, at least enough to pay fees. Entrance fees usually can be paid in local currency, currency of a country you entering from or USD. The best foreign currency to have in Central America is USD, the exchange rate for it is always good. 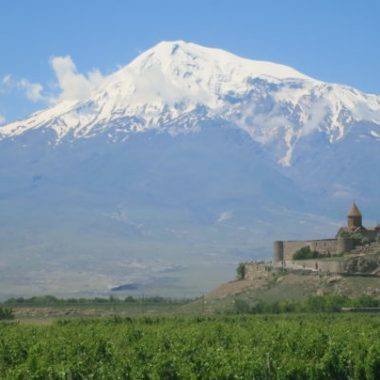 Backpacking Armenia, see where Noah stranded The Ark. I want to drive in my personal car,from Monterrey to colombia,its a good idea? Sonebody there? Hello, Tizoc! Not sure which Monterrey you mean, the one in Mexico? We didn’t drive to Colombia but as I know there is not way of crossing from Panama to Colombia overland, there used to be a ferry between the two countries but it was shut down in 2015, I don’t know if there is any way of transporting a car from Panama to Colombia. Ooh, I love my passport stamps. does that mean if travel between the CA4 countries I won’t get s stamps. It seems like you didn’t a get stamp in El Salvador. By the way, I like your travel notes. Hi, Mutlu! Thank you for reading our blog! El Salvador is the only Central American country you don’t get stamp for, the rest a stamp you twice when you enter and exit.